Supposedly their magnum opus. It is at least the second favourite, if not THE, for most fans. A small minority think it's heavily overrated. I kind of fall in between the extremes. This album really is about two stories. The story of Scheherazade and then that of the "Other Stories". I am rather more fond of the latter here and I will attempt to explain why. A little bit more about the music overall, first. It is clear that Renaissance have decided to further penetrate the direction they took with Turn of the Cards. More symphonic, more orchestral and leaning more towards pop than folk. This last point may not please all musically and especially by the time we get to Song for All Seasons, plenty would be getting off. But in my opinion, it taps the talents of their vocalist and chief strength Annie Haslam better. That done, onto the tracks now. Other Stories, I mean of course the other tracks, namely, Ocean Gypsy, Trip to the Fair and Vultures Fly High. Vultures Fly High is the kind of track Renaissance could have done with more of. Short, smart and doesn't overstay its welcome in the least. You may not find it an outstanding piece of music but it is also rather hard to find fault with. It remains a mystery to me why they chose to get more and more ponderous and stately rather than attempt more such tracks. Trip to the Fair is definitely one of my favourites of the band. Even when I am a little forgiving towards what is sometimes dubbed as their "sissy sound", I am puzzled when they make the effort to step outside it and get more adventurous, they actually fare better. Again, why they dealt less in the area of mystery, suspense and intrigue and more in, um, angelic pathos is beyond me. Whatever, this is a beautifully paced track. For once, their characteristic extended piano intro doesn't feel a bit overlong and builds up suspense beautifully with faint vocalising in the background. Renaissance deftly balance their strong classical preferences with a bit of Brubeck, resulting in a piece that, while tightly and thoroughly composed, is still loose enough to possess some breathing space and gently surprises you with little twists...quite unlike mostly everything else this lineup has done. Annie has to step a good deal outside her own comfort zone too, going legato here. Indeed, some of the landings are not the most satisfactory, but she compensates by brilliantly dramatizing the mood, leaning on her girlish undertone to infuse a hint of mischief and humour in the proceedings. Ocean Gypsy is a more pop take on their essential stately, plaintive melancholy. While the musical soundscape is gorgeous, it also threatens to get rather predictable. But pop means more soaring choruses and more elbow room for power and that lets Annie stand out just enough to save the situation. This is, in my reading, the first Renaissance track where her immense potential is truly actualized. Without getting into too much technical detail about the singing, let me just say that what makes her approach wondrous is she relies so little on vocal riffs or melismas, so little as such on any overt ornamentation but keeps it going with incredibly precise, minute, subtle modulations in her attack. At the same time, she is able to suggest just enough human warmth and charm in her emotional interpretation to make it appear more as if it is something carefully crafted rather than robotically forged in a factory. While Ocean Gypsy is not necessarily the shining vocal highlight of her career, it is an excellent demonstration of the core strengths. Oh, and did I mention her diction? And now onto the ostensible main course. And it is rather a letdown after my appetite is built up through a tight trio of tracks. Not much noodling here, not even any slips into their traditional weakness of playing long sections of music where nothing much happens. As such, Scheherazade is one of their most tightly composed, well arranged pieces. But I really must say this is a case of emperor's new clothes. Parts, where are they? Hardly any part truly grabs my attention and some of them quite frankly sound tired. And while the composition is well put together, it is not particularly intriguing in its construct. To compare Renaissance with a King Crimson or Can would be grossly unfair because we full well know their respective rightful places in prog. 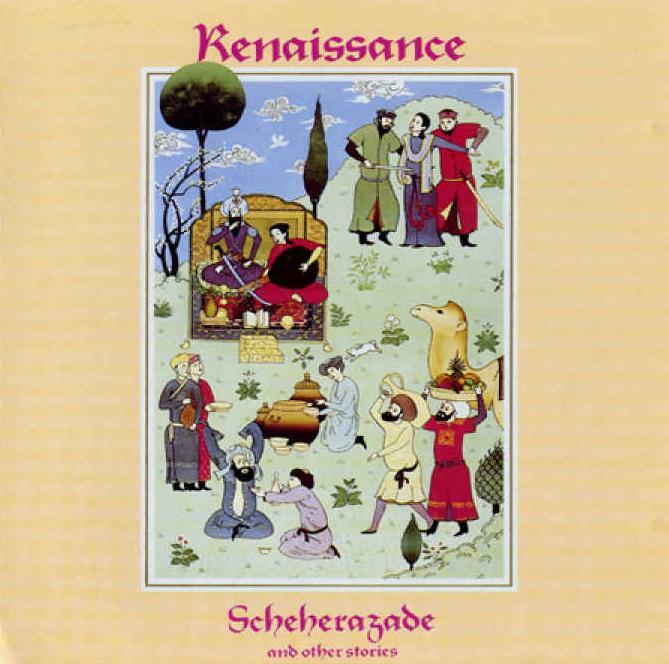 But a comparison of Scheherazade with says Larks Tongue in Aspic Pt-1 brings out the difference between the good and the great as far as prog goes. Renaissance seem unable to think very unconventionally in terms of structure or even textural elements where King Crimson are highly inventive in these departments. Ultimately, the piece has to be listened to more for its organization. Which brings me to emotional resonance, or lack thereof. With so much music going on, Annie doesn't get a whole lot to do. No, actually, it's a very demanding composition for her, technically, spanning a simply awesome range. But she is forced to play a part and cannot really project much of herself on the song. The overall impression is of a lot of pretty music going on for 24 minutes. It's good but certainly could be a lot, lot better. And so, because the piece de resistance, the title track, doesn't quite achieve for me the status of a masterwork, I cannot give this album five stars. A hearty four stars it will be, though.